Lots of people think that Rolex watches are unaffordable, and while it’s true that they’re not inexpensive, with prices ranging up to nearly $500,000, not everything in their product line is priced that way. The Rolex Air King, in production for roughly 70 years now, is an attractive, rugged timepiece that proudly wears the Rolex name at a price point that’s as appealing as the watch itself. Inspired by the Royal Air Force in World War II, the Rolex Air King has been continuously in production ever since and is one of the company’s most popular models. Read on for the full Rolex Air King watches review. Despite the lower price point, the Rolex Air King build quality is in line with the rest of the company’s products. They use scratch-resistant sapphire crystal, and rugged stainless steel cases and bracelets. The model is water resistant to 100 meters, and while that’s not excessive, we should remind you that this watch is called the Rolex Air King, and you’re not likely to encounter a lot of deep water in the air. That said, this model is every bit as rugged and reliable as the rest of the company’s products and you can expect to get years of good use out of it with proper care. Internally, this watch is much like the rest of the company’s line; there is a Swiss-made automatic mechanical movement inside. As there are no complications, it’s a straightforward timepiece, but its simplicity is the reason that the model has so many fans. With simplicity comes reliability; there’s simply less to go wrong. This model is going to tell the time and it’s going to tell it well. There’s not a lot of innovation; it’s a simple timepiece that was created to be a working tool for airmen who needed to tell the time. 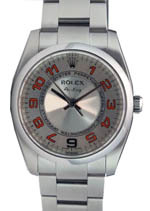 There are more advanced models in the Rolex product line for pilots who need more; the GMT Master II, for instance, offers multiple time zones. 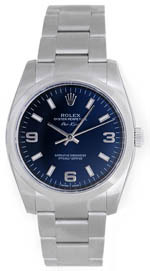 The Rolex Air King is a basic model, so you’re not going to find a lot of options or bling among the product choices. The cases are all stainless steel; you’re not going to see gold or platinum in this model. No diamonds, either, though we’ve seen diamonds added to this model by third party marketers. Your options basically consist of what color you’d like for the face. There are a couple of choices there. Aside from that, this is a basic, no-frills wristwatch, though it is an attractive one and it will instantly be recognized as a Rolex by anyone who sees it, so you’ll still be welcome at Rolex owner meetings. On the other hand, the relative lack of choices helps make this the most affordable watch that the company makes and that’s a big part of the popularity of the model. Like any other precision mechanical timepiece, this model does require extra care and maintenance. Of course, you’ll want to keep it away from extremes of temperature and from strong magnetic fields. You should store it in a watch winder when not in use to keep it working properly and keeping correct time. 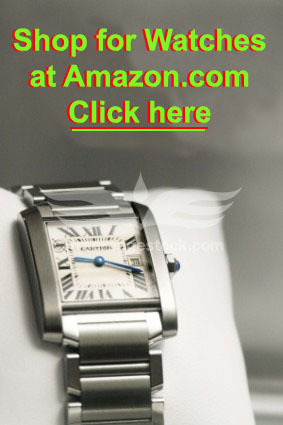 It will be necessary to send the watch back to the manufacturer every five years or so for a complete service. This involves having technicians disassemble the watch to examine it for worn parts, which, if found, will be replaced. All the other parts will be cleaned and lubricated and the timepiece will then be reassembled with new watertight seals. Then the technicians will test it for accuracy and water resistance before cleaning and polishing your watch. When you receive it back in the mail, it will look and work as good as it did the day you bought it. The warranty is the company’s standard one; you will find the watch warranted against defects in materials and workmanship for two years from the date of purchase. As these are thoroughly tested before leaving the factory, we think you’ll find that defects are quite rare. Should you encounter one, rest assured that the company will fix it promptly. As luxury timepiece prices go, you’ll find that prices for this model are quite reasonable. Unlike some of the company’s models, which can sell for prices in the upper five and six figure range, this one is very affordable at about $5000. It’s got the same build quality as the rest of the company’s products; it’s just more of a model for those of us who can’t afford complications, gold, platinum or diamonds on our timepiece. It’s still attractive and reliable and for the price, a terrific value. 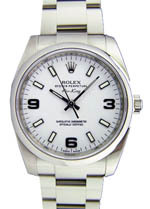 Like many luxury watchmakers, Rolex strictly controls the pricing and distribution of their products in order to keep demand high and to avoid the perception that their products are either common or ordinary. Because of this, you can officially buy only through a small network of authorized dealers, which are usually high end jewelry stores located in major cities. It is possible, however to buy online, as a few retailers do carry them, and you’ll be able to save quite a bit of money buying that way. The Rolex Air King has a rich history, being one of the oldest continuously produced models in the company’s legendary product line. It’s rugged, attractive and available at an attractive price point, making it a good buy for a lot of people who want to own a Rolex but don’t want to take out a second mortgage on their home in order to buy one. If you like looks, quality, reliability and value, the Rolex Air King is a great choice. Watch Complications - What are They?